Decreased lifespans: Have we been looking in the right place? The Bible is not the only place to record that people lived for many hundreds of years in ancient times, but it does so in exquisite, documentary detail. Adam lived to 930 years of age; Methuselah to 969; Noah to 950. This is of course in marked contrast to the modern situation. By not discounting infant mortality, the data on average lifespans in cultures and times without the benefit of modern public health measures have been skewed downward drastically. I recall in my youth hearing figures being thrown around about an average lifespan for an ancient Roman of around 30 years, which made it seem to the casual observer that it would have been rare to see middle-aged or old men in Rome. This was not the case; a more realistic picture of longevity is gained by looking at the average age at death (excluding war) of adults. That is, recording only the average age at death of all who have passed the hazards of firstly childbirth, and secondly disease in infancy and childhood, which is where truly great advances in survival have occurred in modern culture. It is likely that on such a basis, the last few centuries have seen little improvement in lifespan over the situation prevailing at the time of David’s lament at the beginning of this piece. Politicians worry about the fact that our present Western populations are getting a larger proportion of aged which is set to increase over the next few years. However, it is often forgotten that this is only marginally due to medical advances keeping people alive longer. The real reason why far-sighted governments wonder where all the future age-pension moneys will come from is because there is a population ‘hump’ moving through—quite simply, the post-war baby-boomers are getting older. In time, therefore, the proportion of aged can again decline. Today, though there are occasional rare reports (usually with absent or dubious birth certification) of people living somewhat longer, it seems that there are no well-documented cases of anyone living for more than 120 years, and these are in any case very exceptional. David’s ‘three score and ten’ (a description of a situation, not a biblical promise or proscription) is still near the mark today on average. A casual scan of the biblical ages at death seems to show them hovering around those large figures up till the time of the Flood, with a fairly steep decline thereafter. Creationist explanations (of this drop in lifespans) to which I have been exposed (and have often put forward as possible answers) all seem to, not surprisingly, focus on environmental factors. A global Flood would obviously be accompanied by massive environmental effects—so a universal change in human lifespans at around the same time would naturally appear to be related. These attempts mostly focus on the water vapour canopy theory. For example, it is suggested that this canopy shielded the earth from harmful ionizing (cosmic) radiation to which, in its absence, we are now all exposed. The same would have been true of the stronger magnetic field in the past, observed to be still weakening today.1 However, the canopy is usually foremost in such explanations. It has also been proposed that the greater partial pressures of oxygen and/or carbon dioxide under such a canopy may have contributed to greater lifespans. However, one needs to ask whether there is any evidence that such environmental factors really do have a major effect on human senescence and lifespan. These explanations also presume that there was such a canopy, which is a matter being argued out elsewhere. Increasingly, the consensus among the current generation of creationists at the cutting edge is (on the basis of exegetical and scientific arguments) pointing away from the necessity for—or even the likelihood that there was—such a canopy (for more information, see Where did the water come from? chapter 12 in the The Creation Answers Book). If background radiation has such a powerful ‘aging effect’, then in principle this should easily show up experimentally. One would expect differences, for example, in populations naturally shielded from or exposed to differing degrees of such radiation, whether among humans or animals. It should be relatively easy to raise mice in a completely radiation-free environment and see a massive increase in lifespans. Proponents of the ‘different gas pressure’ models have an even more difficult time explaining how this could affect longevity. I propose an experiment involving raising successive generations of mice in a hyperbaric atmosphere to attempt to test many of the speculative ideas about the effects of such an atmosphere on both longevity and ‘giantism’. All positions which attempt to explain the ‘lifespan drop’ in environmental terms have another bit of data to explain, and that is the temporary persistence of longevity after the Flood. Noah was 600 at the time of the Flood, but lived another 350 years afterwards, in the post-flood atmosphere! Even in pre-Flood terms, Noah was already of moderately advanced age. One would presume that, if the post-Flood atmosphere/environment has such devastating effects on us now, then because Noah would have been instantly exposed to these same effects, it should have cut his life short much more rapidly. Actually, only Methuselah and Jared lived longer than Noah. Remember that these environmental effects are supposed to age us eight or nine times as quickly as we would normally. Also, with the canopy gone, for example, why would the reduction in lifespans not appear in one single swoop, in the very next generation? A quick glance at Table 1 going down the generations, all born after the Flood, shows that such a one-step drop seems hardly to have been the case. Table 1. Ages at death of the patriarchs born after the Flood. Even though the post-Flood decline is obvious, we see that eight generations after the Flood, people are still living more than twice as long as is common today. It would seem much easier to explain the situation if the change occurred within the makeup of humans, rather than external to them. If our longevity is genetically pre-programmed, then that can explain why Noah still lived for a considerable time after the Flood, regardless of any change in radiation or atmospheric pressure. In other words, he was fulfilling his genetic potential as far as lifespan was concerned (in the absence of accidental death or disease). Barring accidental death, one-celled organisms are potentially ‘immortal’. A bacterial cell reproduces by dividing into two where there was one, those two then become four, and so on. Why then do multi-celled organisms die? Individual human cells in tissue culture divide some 50 times and then stop -some sort of pre-programmed genetic limit is reached. Human tumour cells, on the other hand, can be propagated indefinitely by division -the DNA mechanism for preprogrammed cessation of division appears to be lacking or damaged in such cancer cells. In multicellular organisms, once damaged and worn cells can no longer replace themselves, death is only a matter of time as the function of whole organ systems deteriorates. So even without accidents or disease, there is a programmed ‘upper limit’ on our age, which appears to be 120 years or so as previously stated. I suggest that our ancestors simply possessed genes for greater longevity which caused this ‘genetic limit’ to human ages to be set at a higher level in the past. Suggestive evidence in support of this is the fact that in some other organisms (for example, fruitflies), it has been shown that changes in average lifespans can be bred into or out of populations. Most of us also know of individual family lines in which many successive generations all seem to live to very ripe old ages, with apparently delayed senescence relative to the norm. Reports of entire populations (for example, the Hunzas) living to 100+ far more frequently than is the case in our society (in spite of indulgence in tobacco and alcohol) has caused many to hunt for their dietary secrets. However, genetics would seem to provide an obvious answer. If this suggestion has merit as the major (if not the sole) cause of greater pre-Flood ages, then the obvious question is how some of these longevity genes were lost. The human population went through a severe genetic bottleneck at the time of the Flood—only eight individuals. 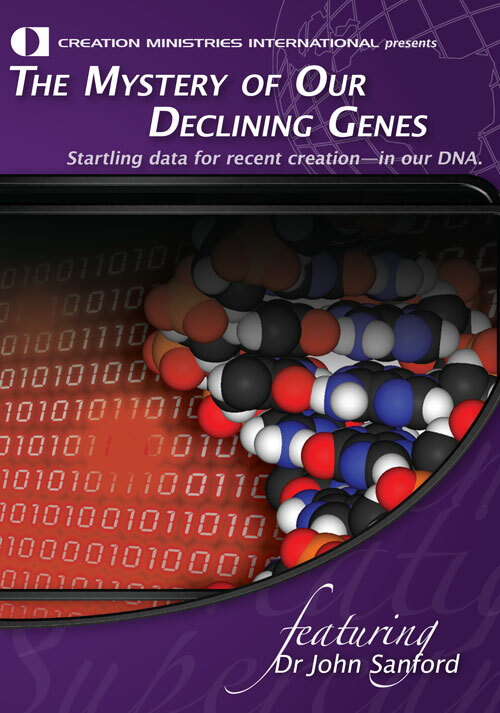 The phenomenon of ‘genetic drift’ is well-known to be able to account for ‘random’ selectively neutral changes in gene frequencies (including the loss or ‘extinction’ of genes from a population) which may be quite rapid. Also, loss of genes is far more likely in a small population. An extreme example would be a population reduced to two, having only one offspring. At any particular gene locus, if mother and father carried four alleles (A, B, C, D) then it is inevitable that two of these genes will be lost in that time, with each gene having only a 50% chance of surviving into the next generation. If there are two offspring (the minimum needed for continuation of the population) then all four alleles might possibly survive, but it is far more likely that one or more will be lost. No matter how large the subsequent population numbers become, the loss is irreversible. This brief essay is meant solely as a stimulus to further thought, not as a precise model of events. However, it would seem that an explanation along these lines would be feasible, especially if several genes contributed to such longevity. 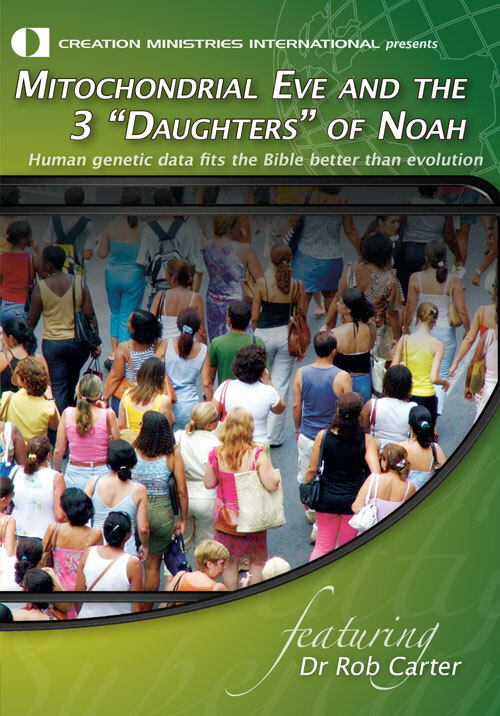 For this scenario to work Noah’s sons and their wives would have to have significant heterozygosity at the relevant gene loci. That this could well have been so is suggested by the age of Shem at death -600, considerably less than that of his father. ‘Short-lived’ alleles of the relevant genes may always have been present, which would mean that in the pre-Flood world, there would have always been some individuals (homozygous for such alleles) living drastically less than the ages recorded for the patriarchs. It may be that these individuals would not have been as short-lived as today, since they might still have had other longevity factors which were subsequently lost, by drift, entirely from the world population, in the first generation after the Flood. Such a loss may account for the major drop in the descendants of the Flood survivors, from the 600+ range to the 400s in one swoop. The second-stage drop to the 200s may be the result of a second such loss. It should also not be forgotten that the dispersion at Babel in effect caused a number of bottlenecks once again, although we have no definite indication just how tight these were. It is also likely (if not more so) that genes coding for lesser longevity arose by mutational degeneration, with their frequency of possession rising as time passed. At the moment, too little is known of the exact mechanics of the way in which cells are programmed to die in order to offer more specific suggestions. The information on lifespans given in Scripture does not cover all the world’s peoples then living, but concentrates on one line of descent. The nation of Israel effectively starts from one man (Abraham) and his (closely related) wife, so this is another genetic bottleneck. The course of changing longevity may have been quite different in other population groups. It has been suggested that maybe increased environmental radiation (if such was indeed the case) increased the mutation rate in the germ cells (egg and sperm), accounting for the progressive decline over generations. Even if so, this needs to be clearly distinguished from the usual way in which the ‘radiation’ explanation is used—that is, in this suggestion the radiation causes mutational losses/ damage which affects longevity, but the radiation as such is not being blamed for aging people. This is in effect an admission that aging is dramatically dependent on genetic factors, which is the point of this article. However, I would resist the suggestion that the recorded decline is merely due to the ongoing accumulation of a myriad of miscellaneous defects, mainly because of the way in which the decline had already plateaued by the time of David. The accumulation of genetic errors in the human line has continued since David’s time, of course. Each mistake in gene copying will usually only be eliminated totally if it is lethal in the heterozygous condition. We all carry hundreds of such accumulated mistakes, which are not usually obvious in the heterozygous state. Some post-Flood humans may in fact have carried the ‘longevity’ genes to greater or lesser degree over many generations. These genes may have become extinct as the populations did. I suggest that Neanderthal and Homo erectus, for example, give us evidence of genetically distinct humans existing post-Flood. These no longer exist today as discrete populations, although some of the genes coding for some of their distinctive bony anatomy were apparently passed on to some of today’s populations. For instance, some Europeans carry the distinctive Neanderthal bony ridge over the trigeminal nerve opening in the jaw. Some of these lesser ‘longevity’ genes may have survived in some such populations, say in Neanderthals. Since these would, especially during the rigours of the post-Flood Ice Age, have tended to be small and isolated, drift may again have played a major role in the eventual ‘extinction’ of some of the Neanderthal genes coding for the unique aspects of their very human anatomy (for example, robusticity, large braincase), as well as possibly being responsible for the loss of their longevity, if indeed they had such. Beasley2 has suggested that some of the morphological features of such post-Flood humans may in fact be due to greater longevity, which he very reasonably links to delayed maturation. The extinction of human lines with more robust morphology (Neanderthal, erectus) may correlate with extinction of longevity. The robusticity may be the result of genetic longevity/delayed maturation or the same populations may have had [possibly linked] genes for longevity and robusticity. Further exploration of this area, particularly as knowledge of the relationship of genetics to human aging and lifespan increases, seems to be worthwhile. This is relevant to the question of declining post-Flood lifespans as well as to understanding the anatomical variation in early post-Flood humans. Humphreys, D.R., 1986. Reversals of the earth’s magnetic field during the Genesis Flood. Proceedings or the First International Concurrence on Creationism, R. E. Walsh, C. L. Brooks and R. S. Crowell (eds), Creation Science Fellowship, Pittsburgh, Pennsylvania, Vol. 2, pp. 113–126. Coe, R. S. and Prevot, M., 1989. Evidence suggesting extremely rapid field variation during a geomagnetic reversal. Earth and Planetary Science Letters, 92:292–298. Beasley, G.J., 1990. Pre-Flood giantism: a key to the interpretation or fossil hominids and hominoids. Journal of Creation. 4:5–55. Beasley, G.J., 1992. A possible creationist interpretation or archaic fossil human remains. Journal of Creation. 6(2):138–167. Cuozzo, J.W., 1994. 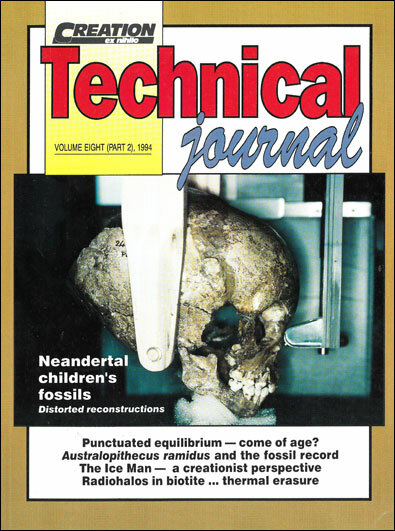 Neandertal children’s fossils: reconstruction and interpretation distorted by assumptions. Journal of Creation. 8(2):166–178.